294 Billion Emails were sent daily in 2010 according to Radicati Group. With 6.91 billion people inhabiting the earth that works out to 43 emails per day, per person. Still, with volume like that, it's no surprise that the question for marketers has evolved from "should we use email?" to "how should we use email?" Unfortunately, the answer for many has become untargeted, non-personalized batching and blasting. 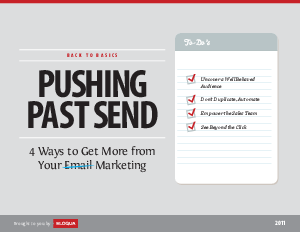 In fact, it's estimated that 90% of today's email is considered spam. Cutting through all of that clutter requires thinking past the send button to leverage a mix of tactics that will drive significant and measurable results from all of your marketing, not just email.